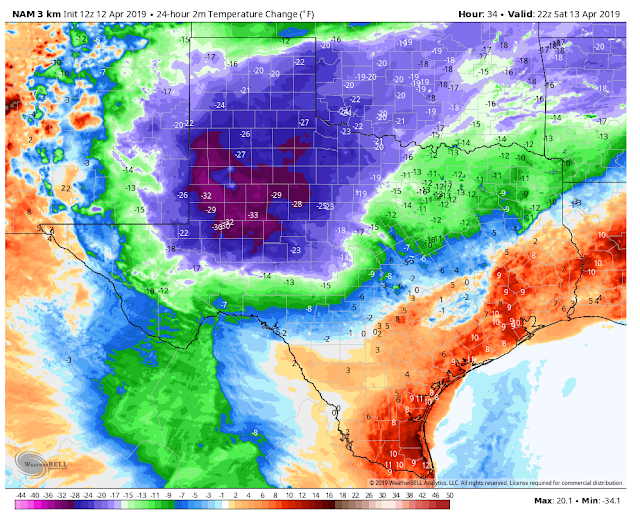 A Cold Rain Mixing With Wet Snow Saturday? This Mornings 6 AM MDT NAM 500 MB (18,000' MSL) Forecast. This mornings NAM 12 km forecast drags our next upper level strong spring storm right over the top of Southeastern New Mexico (centered near Carlsbad) by sunrise Saturday morning. 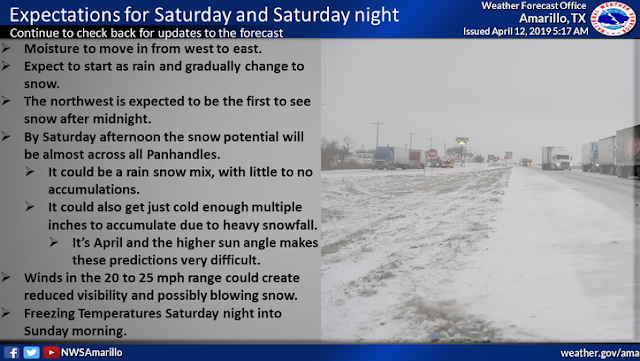 Even though the calendar says we are approaching mid-April old man winter will take another swipe at the area with precipitation breaking out across the local area later tonight. 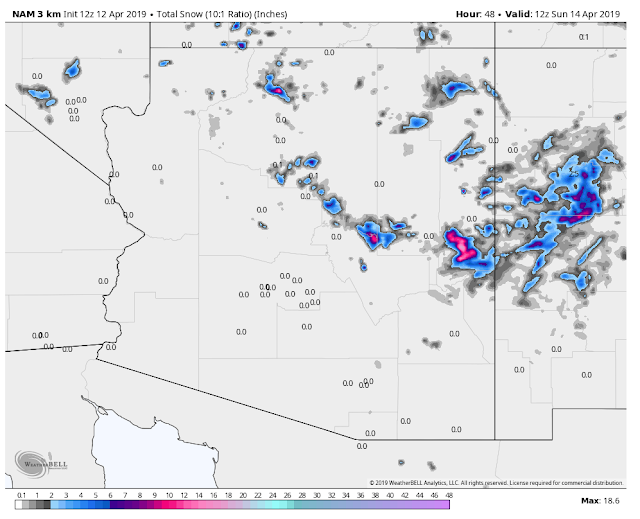 Valid At 6 PM MDT Friday, April 12th, 2019. 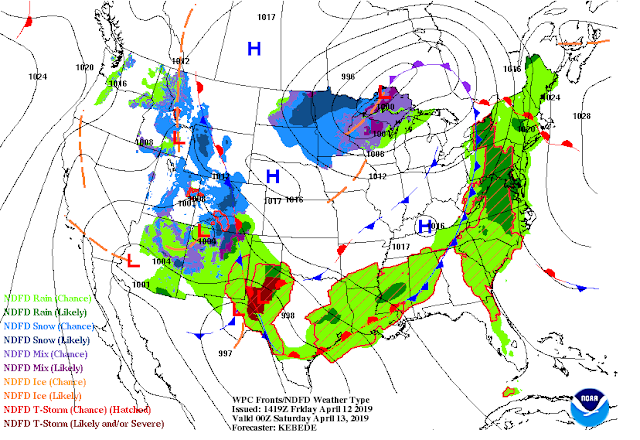 A Pacific cold front and a back door modified arctic cold front will work their way southward and westward across the area late this afternoon and evening. 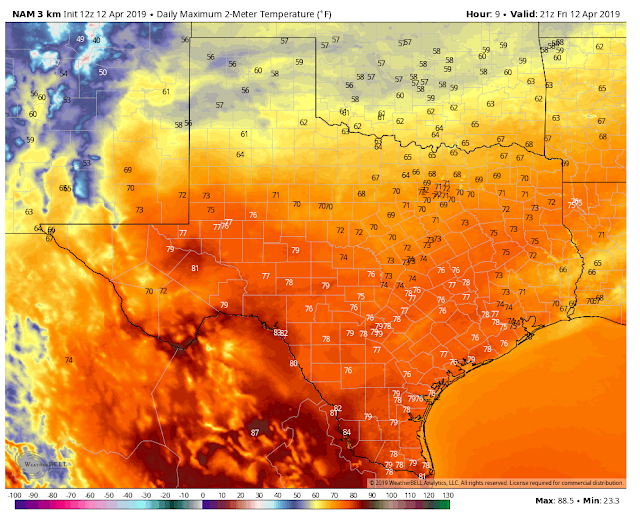 After seeing high temperatures climb up into the upper 60's to low 70's today our highs Saturday in the colder air mass behind the frontal boundaries will only be in the 40's and 50's. 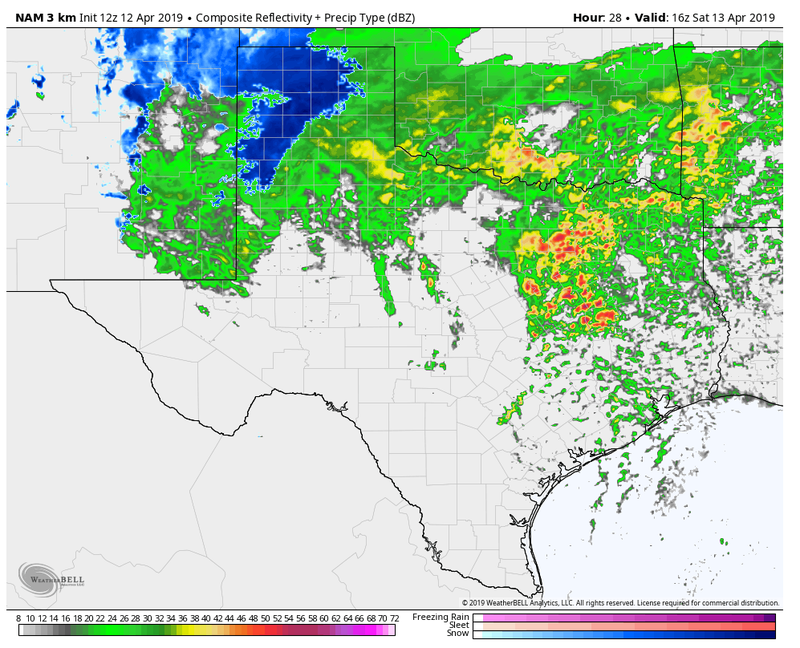 NAM Simulated Composite Radar Precipitation Type Forecasts. 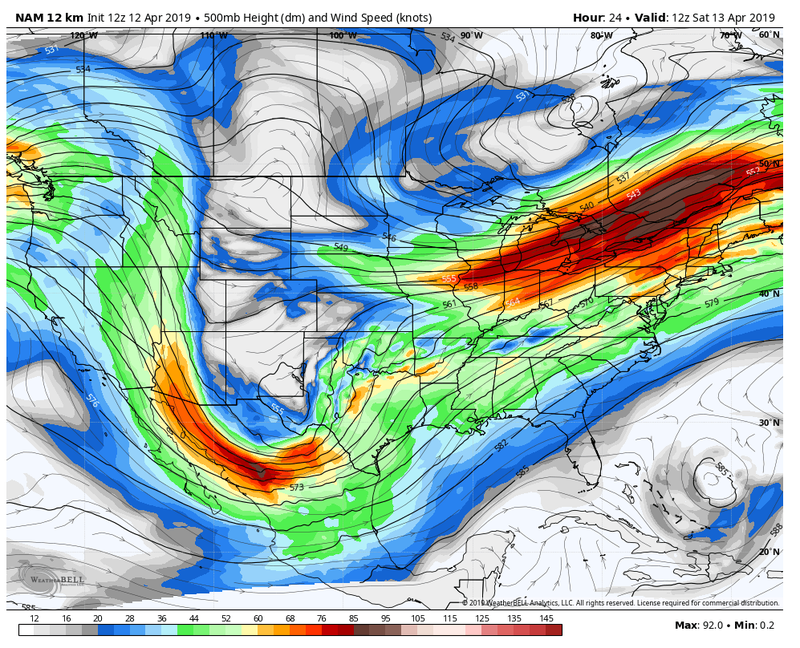 Valid At 10 MDT Friday night. Light rain showers and snow is forecast by this model to begin breaking out over the local area around 10 PM MDT tonight. 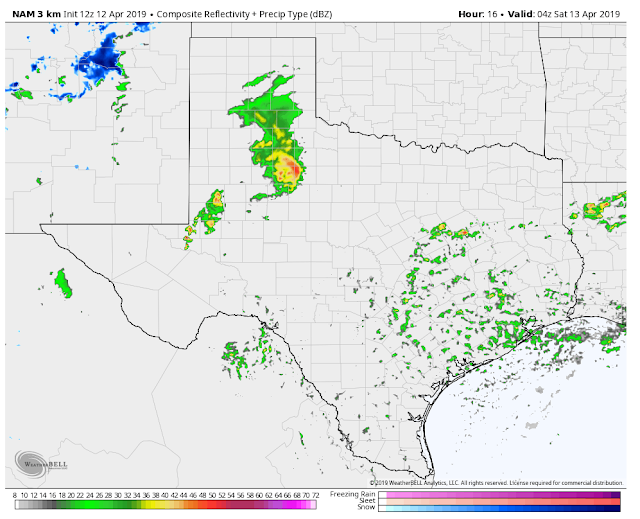 Note the cluster of thunderstorms firing up east and southeast of the Jal, New Mexico area. 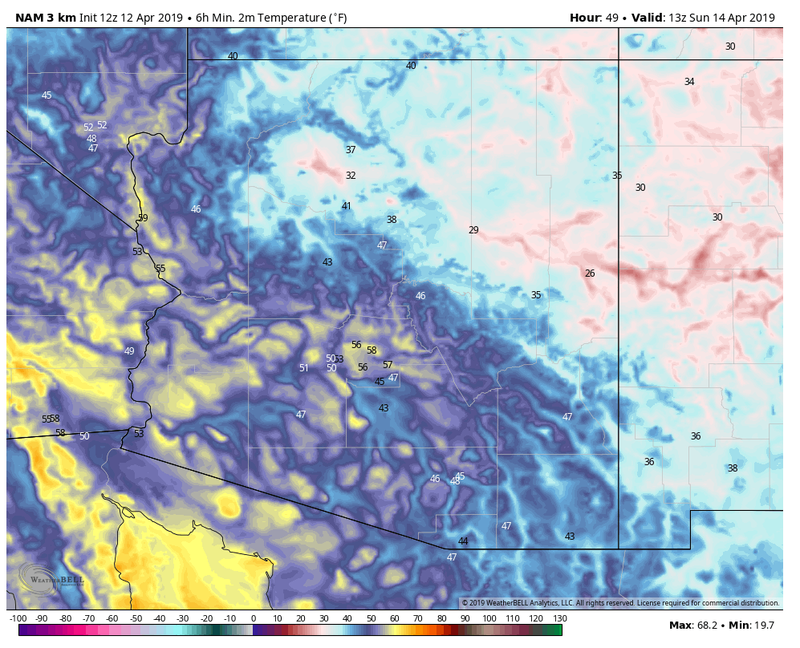 Valid At 1 AM MDT Saturday Morning. 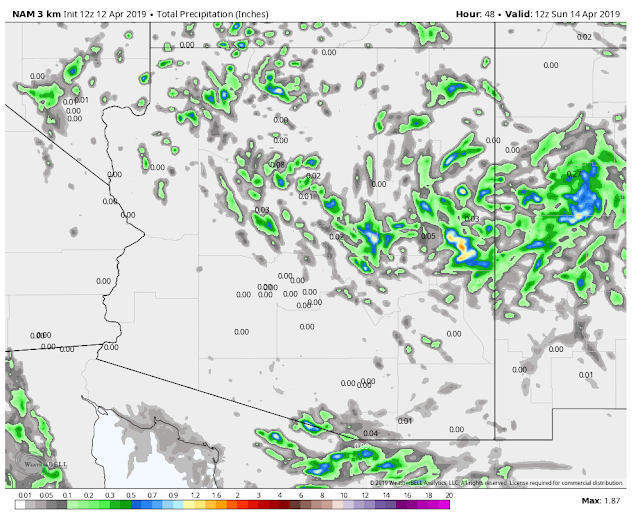 By around the midnight hour a mix of rain showers over the southern plains and snow over the higher elevations of the Sacramento mountains is forecast to be underway. 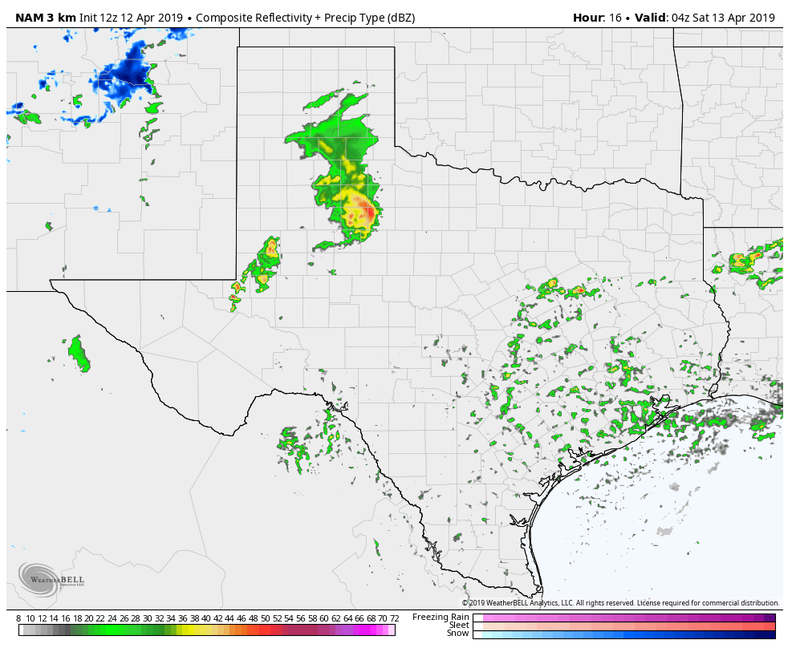 A few thunderstorms may be embedded with this large air of cold rain overnight into Saturday afternoon as well across the local area. 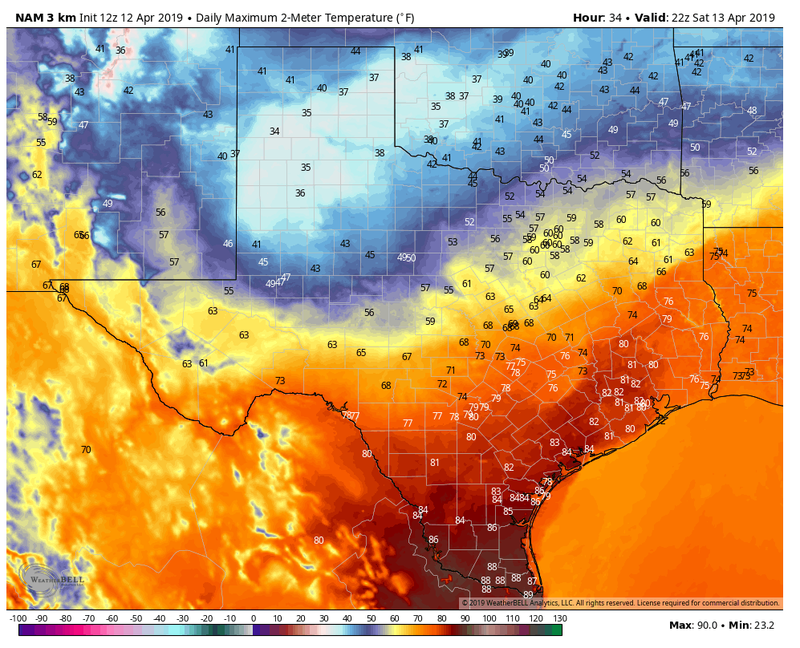 Valid At 10 AM MDT Saturday Morning. This activity will continue to increase in aerial coverage and intensity after sunrise Saturday morning. 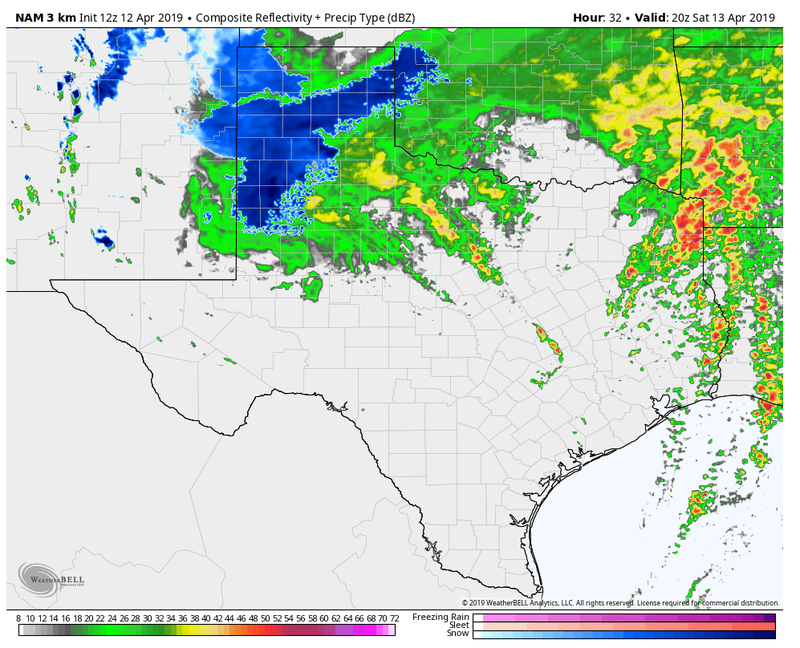 Note the snow developing and spreading southward across the Texas Panhandle into the South Plains and across Northeastern New Mexico. Valid At 2 PM MDT Saturday Afternoon. A cold rain is forecast to continue into Saturday afternoon locally with snow in the mountains. Snow is forecast by this model to move as far south as the Seminole area east of Hobbs. 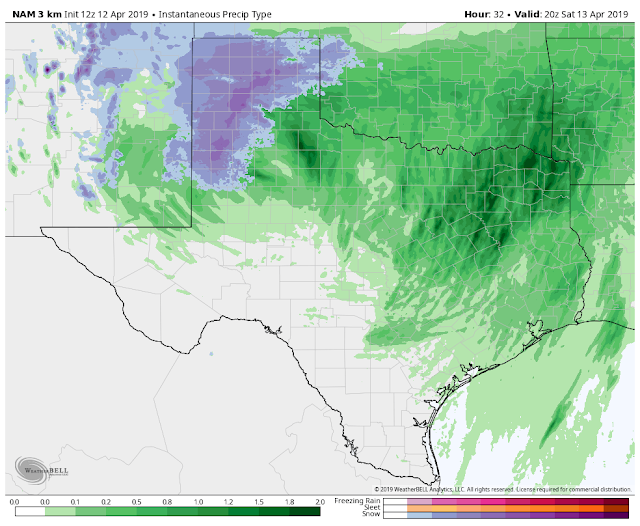 A mix of rain and snow is forecast by this model to fall in the Tatum and Hobbs areas Saturday afternoon. Note: Should the upper level low drop just a tad further to the south and west than is currently forecast as of this Friday morning, then we would stand the chance of seeing snow spreading further west and south into the Southeastern Plains. And the storm total snowfall amounts in the mountains could even be higher than forecast with lower snow levels. Storm Prediction Centers (SPC) Severe Weather Outlook Today. 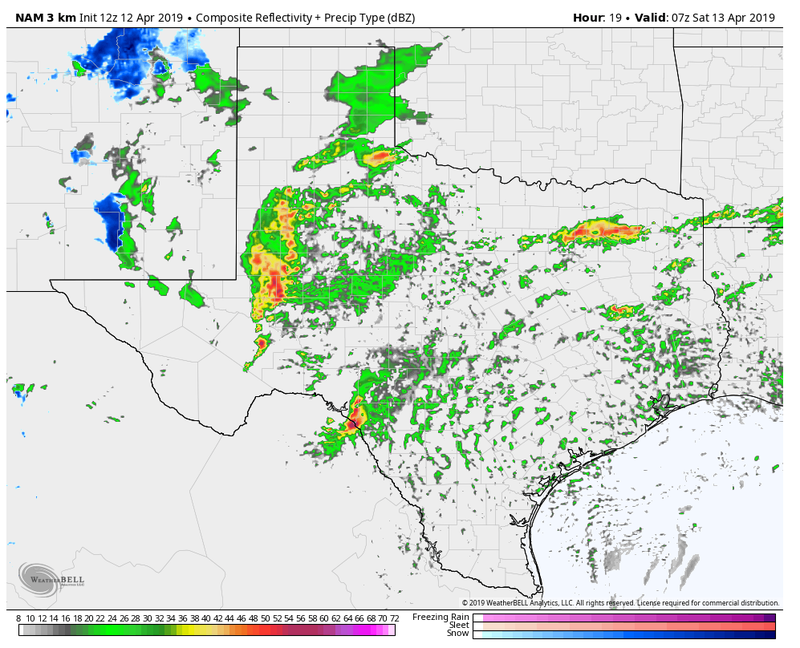 Severe thunderstorms are forecast to develop across West Texas this evening. 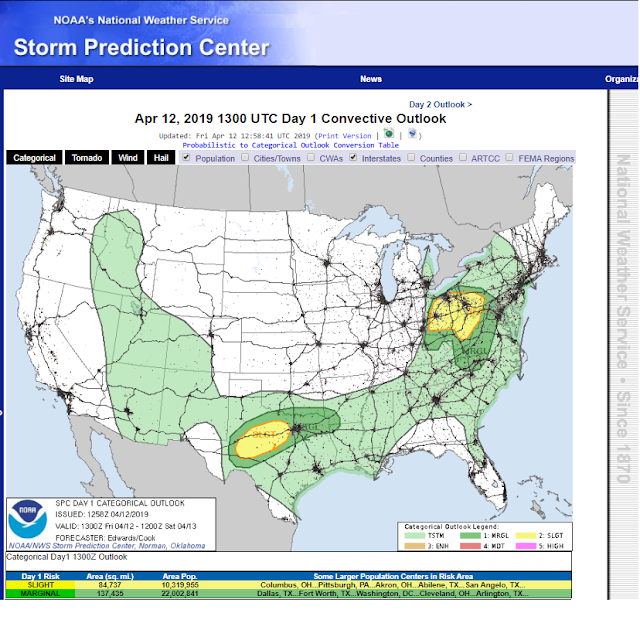 These storms will be capable of producing large hail, damaging thunderstorm wind gusts in excess of 60 mph, deadly cloud to ground lightning, locally heavy rainfall, and a few tornadoes. Saturday's high temperatures will be some 15º to 35º colder than Friday's highs across the local area as a much colder air mass settles in. Highs across the area on Saturday will range from the mid 30's to the mid 50's. 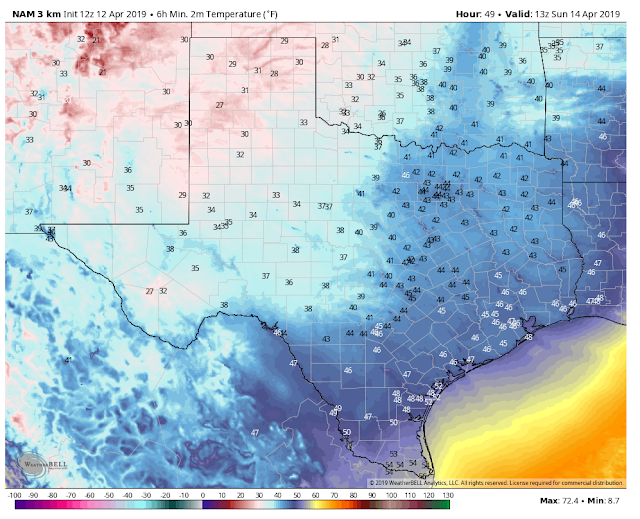 NAM Forecast Low Temperatures Sunday Morning. We've surpassed our average annual last freeze date here in the Southeastern Plains of New Mexico which occurs generally the first week of April. However we have had late freezes into May (and snow) so it won't be unusual at all to see a freeze Sunday morning. 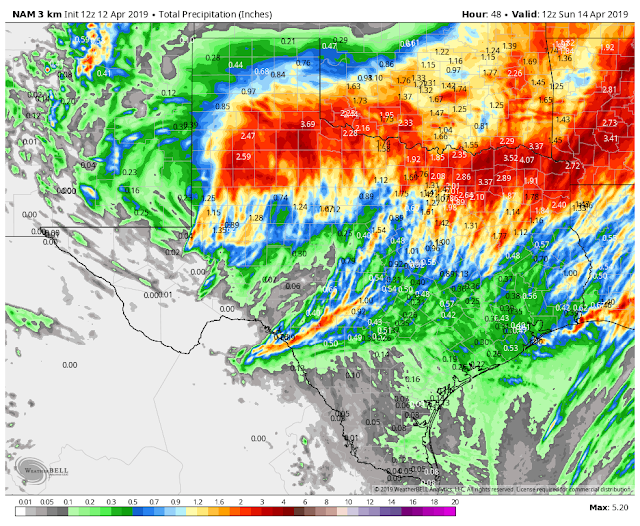 NAM Storm Total Precipitation Forecasts. 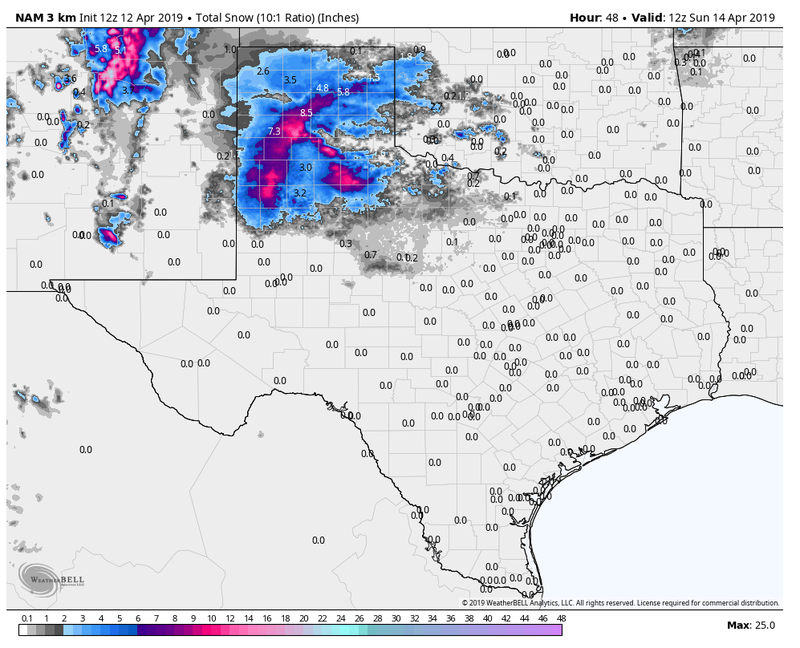 NAM Storm Total Snowfall Forecasts. A cold rain with blustery conditions will dominate our local weather Saturday. If the NAM model forecast is right there is the potential for heavy snowfall over parts of the Sacramento mountains. How much will accumulate and how low the snow level will be is a little uncertain this Friday morning. Courtesy Of The Amarillo National Weather Service Office. 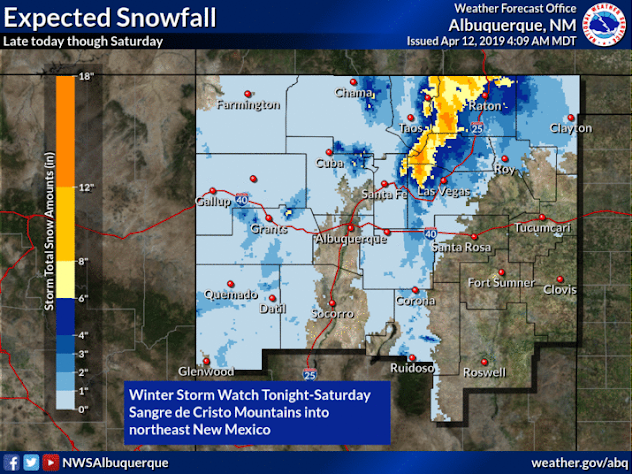 Courtesy Of The Albuquerque National Weather Service Office. 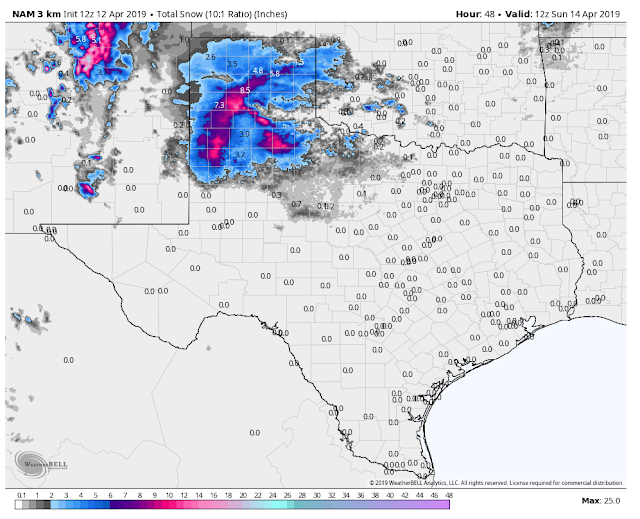 Although this mornings NAM model total snowfall forecast hammers parts of the Texas Panhandle and South Plains by Sunday morning with heavy snowfall its rather up in the air as to how much actually accumulates on the ground. First recent temperatures have climbed up into the 90's across the area thus the ground is relatively warm and will hinder accumulations. Second surface air temperatures won't be quiet cold enough to allow many areas to see accumulating snowfall...unless the storm moves further south than forecast and drags a deeper and colder air mass into the area. Heavy accumulating snowfall is forecast over the northern mountains of New Mexico and the northeastern plains where a Winter Storm Watch has been issued. April late winter-like storms are not at all that rare but they certainly are tricky even difficult to forecast. Much gut tells me that this one is going to turn out some surprises so be prepared for changes in our local area forecasts. Some of us may singing April snow showers bring forth May flowers.